Working in an office as a proper manager-type person who has to sit in official-type meetings and pretend to be an actual grown-up my wardrobe’s increasingly moving away from the whimsical to the classic. I still love my novelty prints and florals, but I tend to save them for the weekend these days. 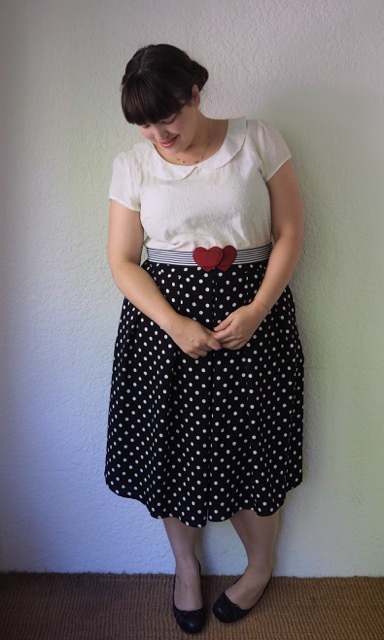 I can’t give up on my polkadots though, and this midi-skirt (currently on sale!) from City Chic is perfectly office-appropriate, especially teamed with a collared blouse and a pair of heeled pumps. There isn’t any stretch in the fabric, but it runs quite large for City Chic, so if you can’t make it in to store I’d suggest that you order a size down from your usual. The skirt’s probably just a little bit too long for me at the moment (though I’m not the tallest lass out there). I’ll probably bring the hem up a little bit after winter, but in the meanwhile it’s a great midi length for the cooler months. If you look closely the spots in the skirt are repeated in the tiny swiss dots embroidered into the fabric of the blouse. 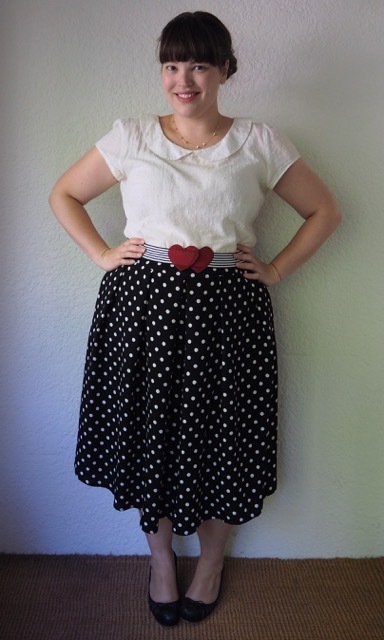 I’ve added my many-years-old (and probably ready for a replacement) double heart belt that I ordered from I Will Fly on Etsy. It’s a nice way to break-up the dots-on-dots, and also inject just the smallest amount of colour… and OK, whimsy into my outfit. 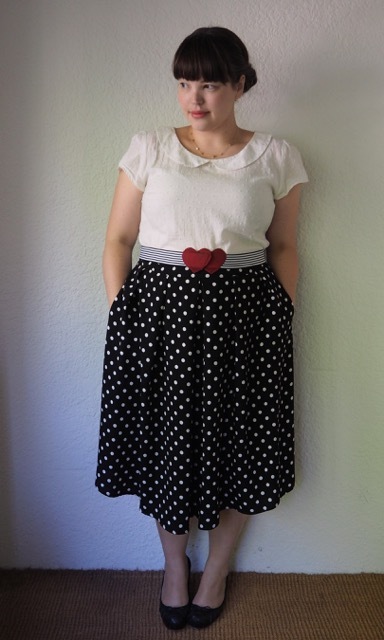 This entry was posted in Uncategorized and tagged Chie Mihara, city chic, etsy, princess highway, skirt, warm by lillipilli. Bookmark the permalink. I looked at this skirt last night, but decided it was too voluminous for me, but when I felt it, I was really surprised at how nice the fabric was. It seems to be made of a much better quality of fabric than they usually use. Seeing you in it is making me regret my decision not to try it on! Thanks Catherine! The necklace is this gorgeous starry number I bought from etsy a while ago – I’ll have to post a close-up! 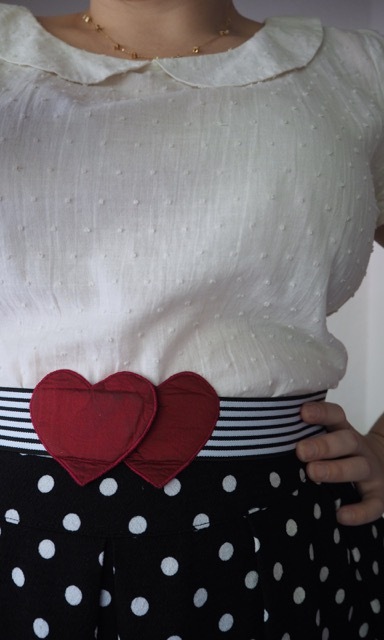 I love your blouse and belt! 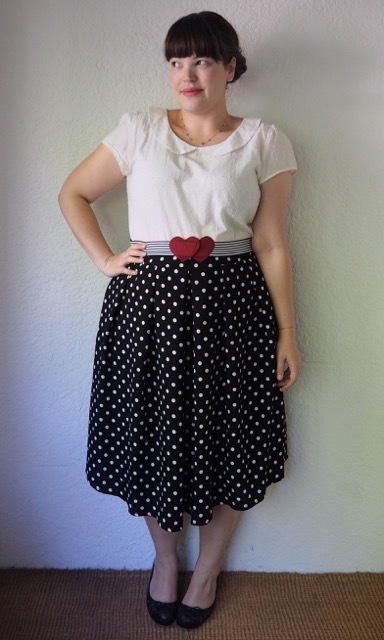 <3 I have a polka dot skirt, but above the knee. You’re like me, aren’t you Chel? A little short? I bet your skirt looks adorable – I’m still a bit too shy about my knees unless they’re clad in tights. This skirt’s just a bit too long though! Wonderful outfit! I love it! Ha, good to know it’s a feeling that never goes away! I feel like such a big faker a lot of the time! You look perfect in this outfit! Love the classic pieces with a touch of personality and extra love all things midi! Thank you, Kate! Me too on the midi thing. LOVE the longer hemline, it’s so elegant! I am finding myself making the same transition from whimsical prints to more clean cut office attire. I can still get away with midi’s and basic prints like dots and stripes, but my hearts, and cats, and cupcakes sit in my closet. I can’t bear to part with them, but I can’t really wear them in “adult” environments. I love your style, lady! Ah thanks Stephanie. Glad to know I’m not the only one. Being a grown-up is booooring, huh?